Repair costs on the rise again | What Car? The cost of paying a mechanic to fix your car is rising again according to the annual Warranty Direct Labour Rates Survey. Since last year (when labour rates dropped slightly), the survey found that the average hourly cost of labour at franchised and independent dealers has risen by 5.81% to 74.82. The average labour rate for franchised dealers is now 90.59 (up from 87.19 last year) with independents standing at 55.90 (52.69 in 2009). That means franchised dealers are nearly 40% more expensive than their independent rivals. 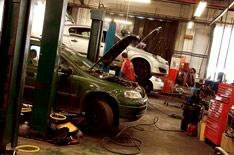 Surrey proved to be the most expensive place to have a car serviced, with an average cost of 87.59, while the highest hourly rate 190.35 was found at a franchised dealer in Hertfordshire. The biggest rises over the last year were in Cardiff and Suffolk, where the survey found that costs had risen by 19.09% and 22.17% respectively. The once-relentless upward march of labour rates appears to have started again after a slight dip last year, says Duncan McClure Fisher of Warranty Direct. To avoid paying above inflationary rises, motorists need to shop around, and not be afraid to push their preferred repairer to charge them less. Despite these rises, though, some areas of the country have seen drops in the labour rates, with the biggest falls in Northumberland and Lanarkshire. Overall, the cheapest places to have a car serviced are almost exclusively in Northern England and Scotland.